Sweetened with high fructose corn syrup, soda has been called Liquid Candy on documentary King Corn. 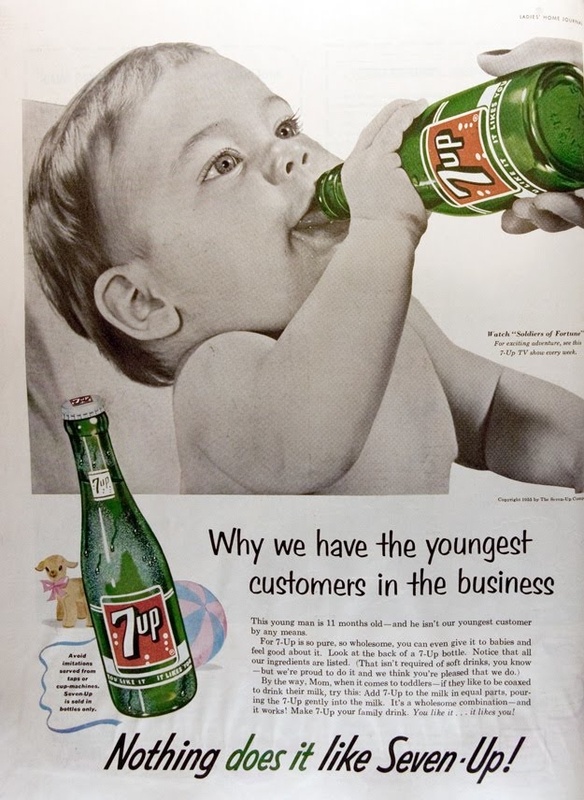 As cases of obesity and type 2 diabetes rise, so do soft drink sales. Tens of billions of this so-called liquid candy is sold each year. Some say we should put a tax on those obesity-supporting drinks to fund health-promoting programs, and many states already do. BlueSky — If you’re looking to treat yourself to some store-bought sugary soda for a treat, opt for an all-natural brand like BlueSky or similar that contains no preservatives or artificial flavorings—just sugar, carbonated water and natural flavorings. Surprisingly, soda is really easy to make…well at least my Fast & Easy version is. For you fancy partiers, try culturing or brewing your own soda, which takes a bit more time, with the other methods listed below. Fast & Easy Soda: Make your own Izze-inspired soda with your favorite juice—we often buy Lakewood Juices because there is no sugar added/sugar substitutes or preservatives and can be found at any grocery store. 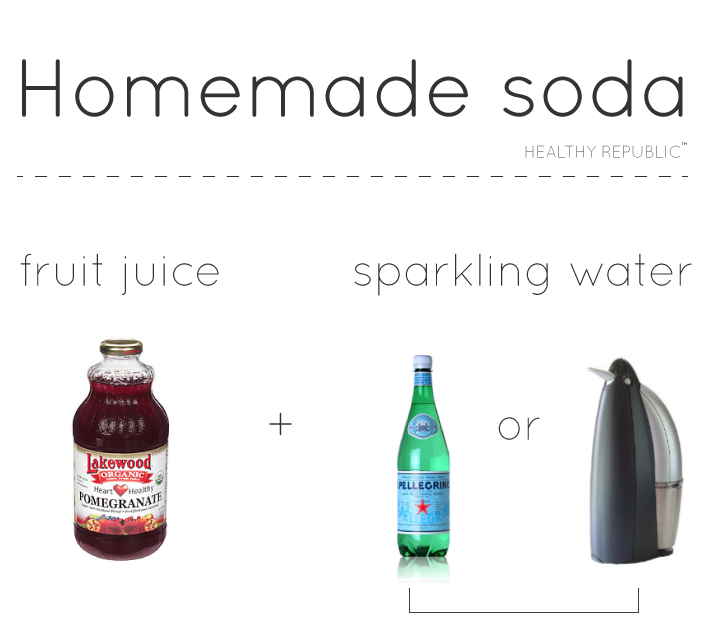 Add sparkling water (either pre-bottled or via a handy carbonating device like Sodastream) and some ice…voila! A delicious, refreshing soda made fresh. Kefir Grains Cultured Soda: Use kefir grains to culture water kefir (soda). See the how-to at Cheeseslave and Nourishing Days. Yeast-Brewed Soda: These brewed sodas use yeast to create the carbonation. See recipe below. Root Beer (recipe via Mother Earth News ): This recipe uses root beer extract, so it’s the one to try if you want the traditional flavor of root beer. You’ll need a 1-gallon plastic bottle for mixing the soda. In a large stockpot, heat the water until warm, about 100 to 110 degrees. Using a funnel, pour the sugar and the extract into a gallon bottle. Next, pour half of the warm water into the same bottle. Then add the yeast to the bottle, attach the bottle cap and shake well. Add the remaining water, then shake again. Pour into 2-liter bottles and attach the bottle caps. Leave 1 to 2 inches of empty space at the top of each bottle. Write the date on the bottles and store them in a warm, draft-free place, ideally at room temperature (68 to 77 degrees) for 2 to 3 days. Then refrigerate the bottles. Makes 1 gallon. Find Healthy Republic on Twitter and Facebook Fan Page. Want to be updated on the latest? Subscribe to the feed here. Fantastic Post! I have a Love/Hate relationship with my Soda drinking, and this just motivates me to find an alternative for my afternoon “time out” when the kids go down for nap! Thanks for sharing! Awesome website!, I’d like to share some helpfull info I found on healthy homemade dog food recipes that I think you guys would find interesting. Most retail dog food is not good for your dog, There are health homemade alternatives for you. 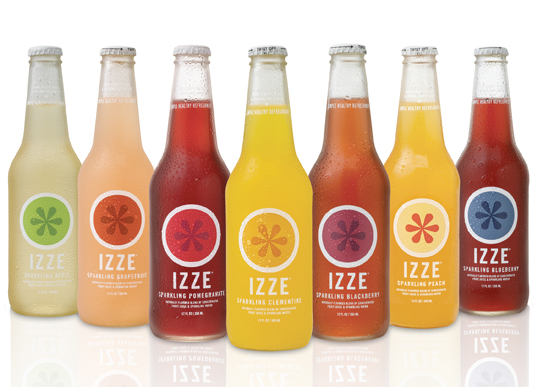 Good post, I tried the Izze soda, pretty good stuff. My brother lost over 150 lbs over 9 months or so a few years back and he always noticed diet soda seemed to slow down his weight loss, I’ll have to send him your blog so he can see why.